If you are using denture adhesive and believe you may be experiencing an allergic reaction, there may be a few reasons behind this. The use of adhesives is common amongst denture wearers and is often prescribed by many dentists. Denture adhesives add to the retention of the prosthetic and have a direct effect in improving chewing ability. They also reduce any instability, provide comfort and eliminate the accumulation of food debris beneath the dentures. In essence, they increase the patient’s sense of security and satisfaction. 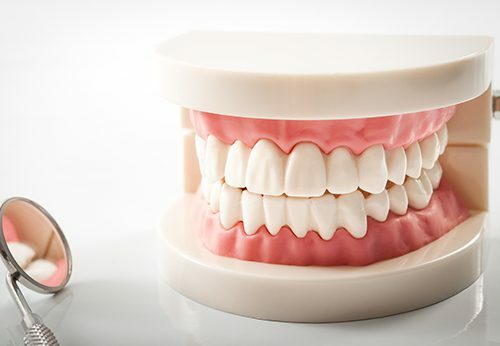 Denture adhesives come in two main forms: paste or powders. Are You Allergic to Denture Adhesive? Though it is very uncommon to be allergic to denture adhesive, you may be experiencing a simple irritation. You may, however, be allergic to a specific ingredient in the adhesive, such as zinc. If you have a known allergy, it is best to check the ingredients of a particular brand of adhesive prior to purchase. In many cases, if you do not have any known allergies it is best to consult with your doctor. What may seem like an allergy could in fact be misuse of the denture adhesive or poorly fitting dentures. Using the correct technique when applying adhesives can help you avoid possible irritation. Paste: apply the paste to wet dentures, preferably away from denture borders. If you notice adhesive oozing, use less product. On the upper denture, apply three short strips or a series of small dots along the ridges and one down the center. On the lower, apply the same three short strips of adhesive (or small dots) in the center of the ridge area. Powder: Powder is fairly easy to apply. Sprinkle some of it on denture surfaces and shake off any excess. Your dentures must also be clean and it’s a good idea to start with less adhesive than you think you’ll need, adding more as necessary. If you still have some concerns or questions our team at Dentures at Clayfield are here to help. Contact our team today! Denture adhesive can improve the sense of security when wearing dentures, though it isn’t always necessary. Well fitting dentures usually do not require adhesives to stay in place. Can denture adhesive be harmful if swallowed? An ingredient found in many denture adhesives is zinc. Zinc can indeed be harmful if swallowed, though it is only considered harmful if swallowed in large quantities.